Hans Fink, who was the editor of Skinnie Entertainment Magazine forever, invited me over for a few beers to talk about comedy articles. My approach to pitching comedy articles is really just based on the fine art of what is called a "shotgun approach," also known as spray & pray. I threw out some lame ones, came up with some slightly interesting ones, and then described the concept of an article called "Political Kung Fu." After touring the Internet for an hour, he was convinced and I wrote it up. The Founding Fathers of the United States established our nation on several guiding principles: justice, freedom, and supreme prowess in the martial arts. The latter category is still going strong to this day. Now, explore the dangerous realm of...POLITICAL KUNG FU! 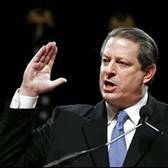 Al Gore may have lost an election in 2000, but he hasn’t lost any of his karate skills he learned while studying under the legendary Japanese sensei, Mas Oyama. Here, he demonstrates a shuto karate chop before a stunned audience. Hiiii-ya! Senator Russ Feingold is not only a staunch supporter of civil liberties; he’s also a master of THE FIVE FINGERS OF DEATH. Trained in the lethal art from years spent in a Chinese Shaolin temple, Feingold can plunge his deadly digits into the chest of a man and rip out the still-beating heart! Senator John Kerry studied with Navy S.E.A.L.’s while fighting for freedom in Vietnam, where he learned the terrifying skill of poking an enemy in the eye with a steel-hard finger! Here, Kerry also demonstrates a classic move- the palm strike, taught to him by the legendary Yip Man, grandmaster of wing chun Kung Fu! 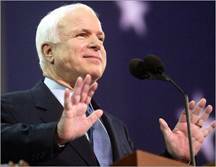 Senator John McCain is not only a military veteran; he’s also a master of the internal kung fu style of tai chi chuan. Here is his signature maneuver, “Iron Buddha Pushes the Gong of Destiny." Ralph Reed isn’t just running for Lt. Governor of Georgia, he’s also able to twist a man’s head off by harnessing the internal power of his ki. This northern Mandarin wrestling style maneuver is 3,000 years old, and only known by a select few. Critics have accused him of pretending to eat an invisible cheeseburger. Ronald Reagan not only fought in WWII, he also brawled in Thailand steel-cage matches, where victory went to the warrior with the bloodiest hands. 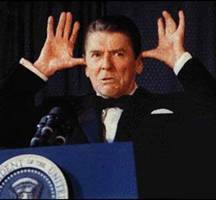 Here, Reagan demonstrates the windpipe-crushing Eagle Claw! 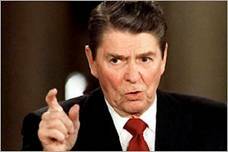 But the awesome Ronald Reagan was also the undisputed authority of the most esoteric of the Canadian Martial Arts…a fighting style that took head butting to whole new level, and could cave in the torso of an opponent with gut-churning efficiency. Behold, the MIGHTY MOOSE TECHNIQUE!